There was an article by Jim Hoft on Big Government that I thought was interesting, in which Hoft states that executive director of the Arab American Action Network, Hatem Abudayyeh, had his home raided in a terrorism investigation and to complicate matters further, Hoft points out that Abudayyeh had visited the White House in April. Hoft also writes that the AAAN was a recipient of almost $500,000 in tax payer money - Hoft implies that the organization is federally financed but the money actually came from city grants from Chicago and was intended to be used to for after-school programs for high-risk students who struggle with English. Because Schlussel (and Hoft) don't have the answers, they only assume that he was pallin' around with Hamas terrorists - which is something else I find interesting because as Chuck Goudie from ABC states, federal officers "were looking for funding links between Abudayyeh and the radical Islamic group Hamas that took power in the Gaza Strip three years ago." If you forgot, President Bush had pushed legislative elections in Palestinian territories, and it was the former administration's actions that had led Hamas to be elected, but because the Bush-backed Fatah party did not win, the world got stuck with Hamas as the ruling government. Because of the recent history involving Hamas I find these FBI raids interesting. As a side note, prior to the election in the Palestinian territories, the fundamentalist Hamas was trailing the secular Fatah in the polls yet Hamas wound up winning. I am reminded of the countless polls done by conservatives that portray a victorious tea party and GOP. Maybe conservatives don’t want to admit that Abudayyeh got a ton of money from the Bush administration, a policy which the Obamaniks are simply continuing. Hey, if the “national security/counterterrorism Prez” can do it, why not Obama? Sorry, but I don’t miss Bush yet. And if you do, see a doctor. Your tax dollars at work. Your money essentially laundered through him to HAMAS, in the guise of English tutoring for illiterate Muslim illegal alien kiddies. Some tutoring probably took place, but as we all know, money is a fungible good, and these grants allowed him to use more money that he, himself, raised for HAMAS via PFLP and FARC. So, how long until Abudayyeh is indicted . . . assuming the feds have the guts, and that’s a big assumption. They did nothing against this guy I’ve been complaining about since before 9/11. Don’t look for fast action now. But if they do act, it’s too little, too late. How many innocent people were murdered courtesy of HAMAS funds he helped raise? There are a couple things of interest with the above article - Schlussel, why kindly mentioning the Bush asministration's involvement with this guy (if there was any), also references the Obama administration giving Abudayyeh money, but as the ABC article indicates, the money received by Abudayyeh were city-level grants. AAAN may have gotten some federal funding but based on the information presented by Schlussel and her sources, it appears that she is inventing the federal government's involvement (during both administrations). Also, Schlussel writes as if the money laundering scheme is fact when it is not - for now it is all in Schlussel's head. 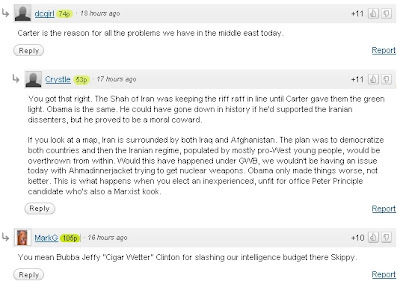 This leads me to my second point - Hoft completely ignores the conservative connection (if any) and implies Obama was funneling money to his Islamic radical buddies, and Hoft's readers don't seem to mind. I decided to give the bloggers and ignorant commenters a taste of their own medicine by linking their messiah, President Ronald Reagan, to the conservative devil, Osama bin Laden. 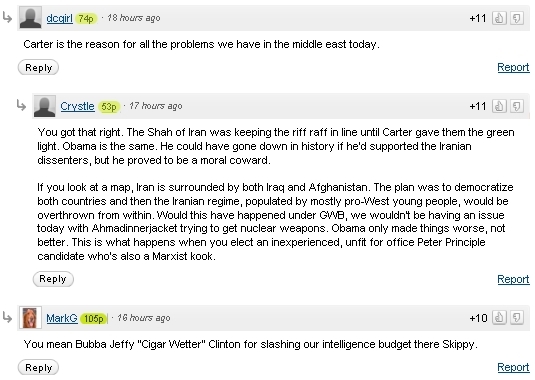 I had received a whopping -73 debate points (and counting) for that eleven-word comment, as well as a bit of flaming. Surprisingly, Big Government actually did something about the comment above and removed it from their website, and in record time, too! Did you catch that? My simple comment must be a "lie or a massive mistake" and apparently Majiic12 thinks Russia was behind Osama bin Laden's rise to power - it is news to me that Russia trained an Islamic army that they were simultaneously fighting in Afghanistan during the eighties. I never realized that the Shah of Iran was doing a bang-up job at keeping bin Laden in check - especially when taking into consideration the problems his government had with Islamic religious leaders, which eventually led to his overthrow. How can all the blame be placed on Jimmy Carter when it was the Reagan administration that funded bin Laden? Basically my little comment proved a big point - right-wing propaganda mills and the people that depend on them have little to no understanding of the facts and are glad to operate off of countless assumptions to make their narrative work. Let's bombard him with complaints!! Nobody - and I mean NOBODY puts down OUR Jon Stewart and gets away with it!! You need to go to the bigjournalism site. Good ol' Andrew says Jimmy Boy owes us an "explanation". Really, That is really big of you, Andrew. I am the father of two girls and his behavior is borderline psychotic. I was all over this topic earlier in the week. I did not use any four letter words but I went after Jimmy Boy in a manner he so richly deserved. Now I am banned for the site. Obviously, a "defender" of the !st Amendment does not like someone point out he has been played by a fool. Keep up the good work, Kevin. Also, don't know how Breitbart could look at this single event and isolate it from O'Keefe's previous projects. O'Keefe is a serial liar, so how can Breitbart still defend the previous work? I don't understand the "Rick Sanchez era" comment - is that in regards to Sanchez's recent "Jews control the media" comment and subsequent firing by CNN, and if so, how can he equate Rick Sanchez's Fox-like "reporting" as indicable of CNN's entire style - I still think the wiretapping narrative was legitimate because O'Keefe was stopped before he could accomplish anything, and he has already shown he is willing to break the law to get his "story." I don't think this is the last we've heard of from Hoft or O'Keefe - despite their consistent failures in getting the facts wrong, Breitbart still gives them work. After reading the comments under Breitbart's post regarding O'Keefe, O'Keefe still has his supporters. These lemmings do not care what he does as long as he goes after all the Marxists, socialists and progressives. They simply have no shame.